Senior Andrew Chrabascz walks out for pre-game introductions against North Carolina. Photo by Jimmy Lafakis. The No. 4 seed Butler University men’s basketball season ended in the Sweet 16 round of the NCAA Tournament with a 92-80 loss against the No. 1 seed North Carolina Tar Heels, who will play the No. 3 seed Oregon Ducks in the Final Four on April 1. The Bulldogs finished their season with a 25-9, 12-6 Big East, record. During their final postgame press conference of the season, Butler head coach Chris Holtmann said this year was special, especially considering what the team’s outside expectations were. For six seniors — Steven Bennett, Andrew Chrabascz, Tyler Lewis, Trey Pettus, Kethan Savage and Avery Woodson — this season was their last in a Butler uniform. In his four year career, Chrabascz started in 104 games and averaged nearly 10 points per game. The forward from Portsmouth, Rhode Island also finished with 1,271 career points, which places him 24th on Butler’s all-time scoring list. “Thank you my family, coaches, teammates, and especially fans. These 4 years have gone by too fast! 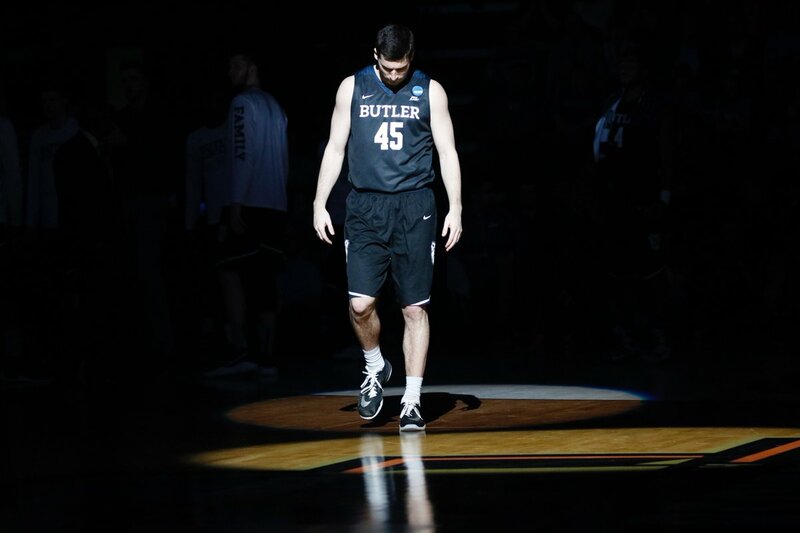 Forever proud to be a Bulldog!” Chrabascz said on Twitter the day after his final game. Savage and Woodson, who only had one year of eligibility as a Bulldog, averaged eight and 8.9 points per game respectively. In his two seasons, Lewis dished out 219 assists. Kamar Baldwin, Kelan Martin and Tyler Wideman will be three key returning players for the 2017-2018 season who have experience in the starting lineup. Martin led the team in scoring this season by averaging 16 points per game. Jerald Butler, Christian David, Cooper Neese and Kyle Young comprise the highest-rated recruiting class in Butler history. Butler, David and Young are all rated as four star recruits by ESPN while Neese checks in as a three star recruit. Butler and Neese are listed as 6-foot-4-inch guards. David is considered a 6-foot-7-inch guard and forward combo while Young is a 6-foot-8-inch forward. Both Butler and Young were state champions in basketball during their senior year of high school. Henry Baddley, Joey Brunk, Nate Fowler and Sean McDermott all return to the program after seeing minimal action this season. Fowler, a 6-foot-10-inch center, played the most minutes of the aforementioned four players and averaged a little more than five points per game. Outside of their typical Big East schedule featuring games with Villanova and Xavier, Butler will play a Big Ten opponent on the road for the Gavitt Tipoff Games, face Purdue in the Crossroads Classic and will participate in the inaugural Phil Knight Invitational in 2017-18.